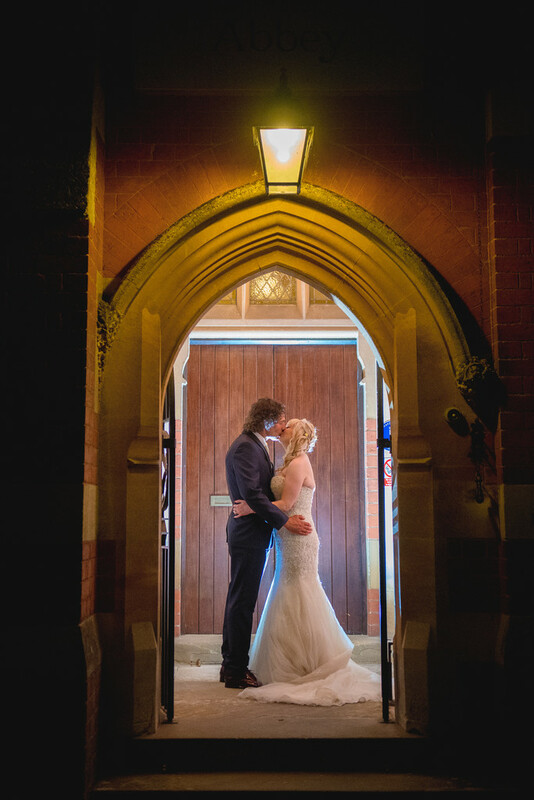 Louise and Matt got married at Worcestershire's Stanbrook Abbey. 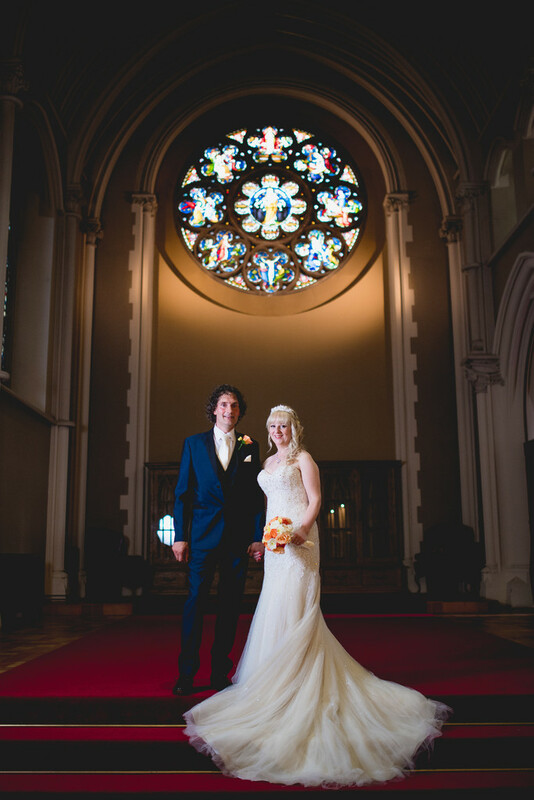 One of the photos that the couple were keen to have taken, was an image with the magnificent stained glass window that's at the one end of the Callow Hall. As the Callow Hall is relatively dark, and the stained glass window being so bright, the only way to take this photo was with off camera flash. I used a speedlight on a light stand and fired the light through a large white umbrella to better diffuse the light which gives the image the soft, natural look you see here. The couple were very keen to have lots of photos taken after the sun had set. As it was July, and it wouldn't be dark enough to do so until gone 10pm, I decided to stay late into the night. During our final pre-wedding consultation, the three of us had walked the venue and discussed all of the locations where it might be good to take some photos after dark. 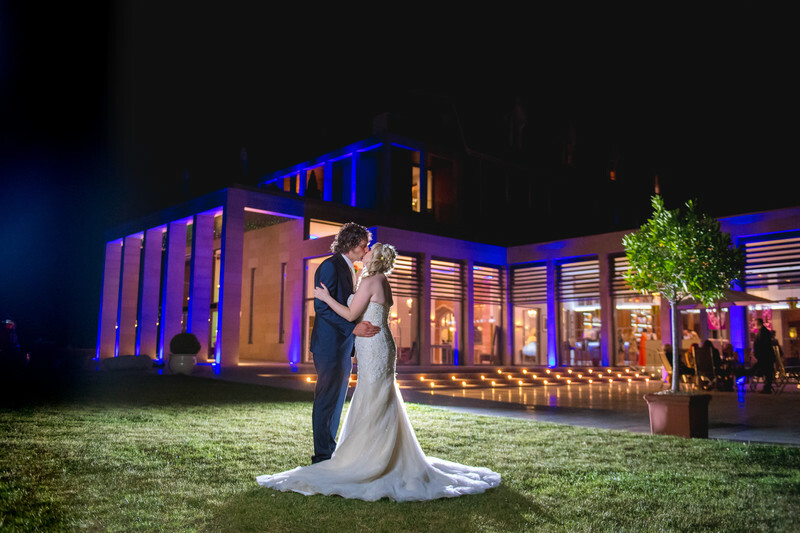 We settled on a few locations, including the Callow Hall, the old main entrance to Stanbrook Abbey as well as this popular location on the new front lawn, looking back at the dramatic lighting of George's Bar. Above you can see the image that we took at the old front entrance. For years, the front entrance of Stanbrook Abbey was the door you see above, but this left a long walk, the length of the cloisters, to reception. In 2012 the venue commissioned the addition of a whole new front, in the form of George's Bar which you can see in the middle photo. The bar is very modern and features stunning uplighting on the outside of the building. Most importantly for the hotel guests, the new front door is right next to reception!